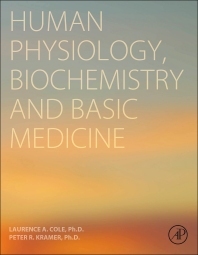 Human Physiology, Biochemistry and Basic Medicine is a unique perspective that draws together human biology, physiology, biochemistry, nutrition, and cell biology in one comprehensive volume. In this way, it is uniquely qualified to address the needs of the emerging field of humanology, a holistic approach to understanding the biology of humans and how they are distinguished from other animals. Coverage starts with human anatomy and physiology and the details of the workings of all parts of the male and female body. Next, coverage of human biochemistry and how sugars, fats, and amino acids are made and digested is discussed, as is human basic medicine, covering the science of diseases and human evolution and pseudo-evolution. The book concludes with coverage of basic human nutrition, diseases, and treatments, and contains broad coverage that will give the reader an understanding of the entire human picture. Dr. Kramer is a former research scientist and university professor (Lincoln College of New England, Southington CT) who founded Ingenium Patents LLC which specializes in providing services to inventors and companies developing new products. In addition to patent drafting and prosecution they conduct critical research into patent and non-patent literature required by R&D managers and technical personnel. Peter is admitted to practice before the United States Patent and Trademark Office. Dr. Kramer has been awarded the National Research Service Award, National Institutes of Health, USA. (1985) and National Science Foundation instrumentation grant, Principal Investigator (1992). He is a member of the American Chemical Society, AAAS, and Mensa.